Which is the most costly vegetable in town (I mean in Mumbai and Thane)? If I say its Kantola you’re likely to be stumped. For, many of you may not have heard of such a vegetable. Okay, let me say “Spine Gourd”. Still stumped. Available during the monsoon months it’s priced at Rs 100 per kg. Also known as Kankoda it grows wild in Chhattisgarh, Uttar Pradesh, Jharkhand, Orissa and Maharashtra. A week or two after the rains had arrived I witnessed Kantola in my farm. Well, I was introduced to it by Mangal, my caretaker. “Saab it makes a great dish,” he insisted. And for the first time I tasted Kantola with potatoes cooked by my wife after she had downloaded the recipe from the Net. Its bitter but is unlike karela. Spine gourd is a nutritious vegetable crop locally known as Meetha Karela, Khekhsa, Padora, Bhaat Karela, Konkani, Kakrol, Kankro, Aakakarakaya, Phagla, Phaagil, Ban Karela, Bhat Karola, Kartola, Teasel Gourd and Boda Kakarakaya among others, in different regions. The Indian Council of Agricultural Research (ICAR) has identified Indira Kankoda I (RMF 37), a variety of spine gourd for commercial cultivation in Chhattisgarh, Uttar Pradesh, Jharkhand, Orissa and Maharashtra. Known to be beneficial to diabetic people, this will be the first spine gourd variety identified for commercial cultivation. ‘Newly identified Kankoda or spine gourd variety Indira Kankoda I (RMF 37) is resistant to all major pests. Its green fruits are very attractive, dark green and ready to harvest for vegetable purpose in 75-80 days from seeds in the first year and 35-40 days from tubers from second year onwards up to five-six years,’ according to ICAR. The crop is popular among the farmers due to its nutritional value and its shelf life. If Kankoda seeds are once sown in the field, tubers sprout at the onset of mon soon every year. A good green yield can be harvested every year and up to five-six years from the same tubers or plants. 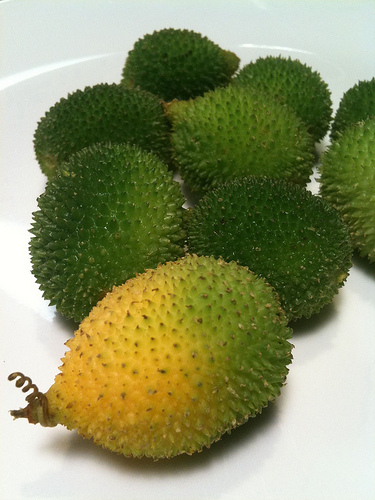 This small, cute, spiny fruit is always used as a vegetable for cooking. It may look spiny but it is so soft to the touch that it won’t hurt your fingers! It is green when unripe and will turn yellow when mature. The seeds are white and soft but it will turn dark brown and hard when ripe. As in most fruits used as vegetables, always get those still in the green stage. It’s rich in calcium, phosphorus, and iron. It reminds one of a cross between a bitter zucchini, okra and a cucumber. But, the texture is denser and a bit tougher. When fried, it reminds one of fried okra with none of the slime. Consumption of spine gourd activates the pancreas and controls the level of sugar. Its green fruits contain 12-14 percent protein. Thanks for this info. All I know about this: we call it kartuli: is that it’s absolutely delicious and I wait for it the whole year. It’s available for no more than 15 days during the rains and is yes, expensive, so I make it a point to have as much of it every season as my budget permits! If I’m able to get the seeds or grafts I plan to have them on my farm. And if it grows and fruits will surely keep some for you. Hi..how are you? do you have kakral seeds? I would like to buy some. I think you forget Rajasthan —– this vegitable is very popular in Rajasthan and during the rainy season this vegitables stems comes out mainly around trees, on the throne partiations (which seperates two fields also known as BAAD). Dark Green is best quality if color changes like white or yellow then this develops hard seeds and not good. If cooked in mustard oil with spices it creates a great flavor ….. I am not aware of nurseries or shops selling spine gourd seeds. If any known please write back. I have producing spine gourd seeds for sale. i am interested in the spine gourd seeds. Where and how can i get it? I came across your site while searching for Kankoda seeds. I love this vegetable and am searching for source of seeds and also Parval seeds for some time. Is the seed shop information you provided, current? Are there other shops that you know of in Gujarat where I can obtain these seeds? I’m also searching for Kankola seeds. Haven’t been able to lay my hands on them. I am searching for this seeds, I am from mumbai, will you please give me information where should I will get these seeds. Its difficult getting seeds of Kantola. It grows wild on my farm. they grow wild during monsoon. i haven’t come across any shop selling seeds. if i do come across will inform you. you just buy ripe kantola from the market and let it dry then plant all the seeds from each fruit in a large pot you will have both male and female plants…just plant them 5″ apart ….wait till they flower then you will need 1 male plant for every 3 female plant. Kantola will produce roots for planting. Hello sir I need spine gourd pls mail me .. I like to know where I can buy or get kakral seeds? Thanks for writing. Kakral grows wild during the monsoon months. I have tried to acquire the seeds but failed. Kantola seedling or stump are not easily available. In fact, the one I have in my farm grows wild. The seed may have been brought by a bird. Sorry, I can’t help. Where can I get teasel gourd seeds from? I have tried various placed but failed. Sorry can’t help. Where can I buy the vegetable in India? Is it available in Chennai? Kantola grow during rains. You need cuttings to grow.